An RV roof cover only covers the roof of your RV, protecting it from environmental damage. They are easy to install as they only weigh a fraction of a full rv cover. ADCO's rv roof covers are constructed of DuPont Tyvek for maximum durability and UV protection. They are water resistant, yet still breathable to allow any trapped moisture to escape. 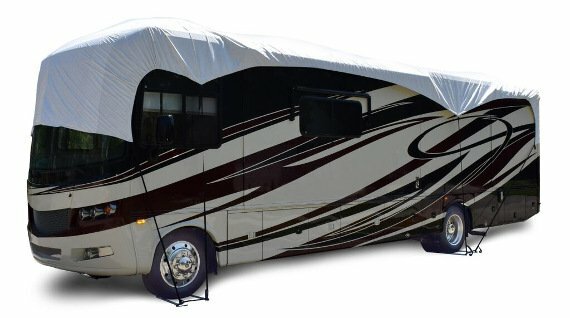 These RV roof covers are designed to accommodate any roof-mounted accessories and attach by ADCO's patent-pending wheel anchor system. This system prevents the straps from rubbing up against the sidewalls of your RV. Each cover comes with a 2 year warranty and a free storage bag! Select your RV's size below. Our Roof Covers receive FREE ground shipping for the continental US. Find printable Installation Instructions here or see the videos below.